Robert Satiacum is an enrolled member of the Puyallup Tribe of Indians. He is the son of the late Chief Bob Satiacum – widely known for his sacrifices made for sovereignty and fishing rights. Satiacum is immersed his native culture, and diligently practices the traditions of the Sweat Lodge, Native American Church, and the annual Tribal Journeys in his family canoe. We reserved the big room on the ground floor of the Legislative building and will make appointments for participants to meet with their legislators. Drumming in the Rotunda and on the steps of the Legislative Building are scheduled! Check back with us for details. Not only inviting you, I’m expecting you! Bring the children friends and family! 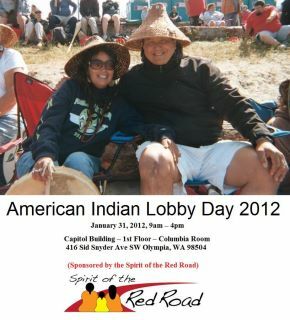 Why, and what is the importance of American Indian Lobby Day? Learn why, how and the importance of registering to vote? How to become Native Ambassadors to GOTV in Indian Country. This entry was posted in Make No Bones Shows and tagged American Indian Lobby Day, Connecting with Spirit, Honoring, Indigenous, KAOS 89.3 FM, Make No Bones About It, Olympia Washington, Raven Redbone, Robert Satiacum, State Captial, The Canoe Way, Tribal Talk. Bookmark the permalink.